After revealing that the Doctor's history was even more complicated than we already knew, in the recent "Day of the Doctor," showrunner Steven Moffat has finally clarified just which number of Doctor Matt Smith is. But a new rumor indicates things are crazier than you ever realized. So Doctor Who first explained that the Doctor had a 12 regeneration limit in the classic Tom Baker serial "The Deadly Assassin." While Matt Smith was the Eleventh Doctor, he was only on his tenth regeneration. But now that John Hurt has been introduced tino the mix, the Eleventh Doctor is now technically on his twelfth incarnation — which would make his transformation into Peter Capaldi's Doctor the thirteenth and final one (so to speak). 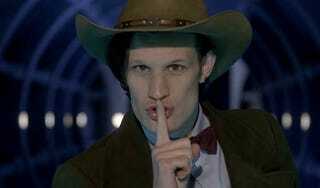 He has no more ever called himself the 11th Doctor than he would call himself Matt Smith. The Doctor doesn't know off the top of his head [what number he is]. If you worry about such things, and I do, then I specifically said John Hurt's Doctor doesn't use the title. [Matt Smith's Doctor] is in his 12th body but he's the 11th Doctor, however there is no such character as the 11th Doctor - he's just The Doctor, that's what he calls himself. The numbering doesn't matter, except for those lists that you and I have been making for many years. So I've given you the option of not counting John Hurt numerically - he's the War Doctor. That makes a lot of sense, and keeps people from having to renumber the Doctors in their heads. However, The Mirror has stated a new rumor — take it with as large a grain of salt as you'd like — that in the upcoming Christmas special, Matt Smith will reveal he's actually the thirteenth and technically final incarnation of the Doctor. Doctor Who will face the end of a 50 year story in the Christmas special – when Time Lord Matt Smith reveals he is actually the 13th and 'final' Doctor. Actor Matt, 31, has long thought to have been the Eleventh Doctor on the hit BBC sci-fi show, which can only regenerate 12 times according to the show's folklore. Fans have worried for years that the show will have to end once the 13th Doctor dies. But on December 25, current theories among millions of fans will be exterminated once and for all when Matt says in a dramatic speech he is the 13th Doctor and adds: "I'm dying and there is nothing I can do about it." On Saturday night at the end of the show's 50th anniversary special, all the Doctors lined up, including John Hurt who was previously not thought to count. David Tennant's Time Lord also used up an extra regeneration to save himself in an episode called Journey's End. A show source explained: "There have been two David Tennant Doctor Whos technically and with John Hurt playing another Doctor in the film, it basically means he can't regenerate again. "The riddle of the regeneration problem, something fans have talked about for decades, will be faced head on at Christmas. There is going to be another huge cliffhanger and somehow Peter Capaldi has to join and the series has to continue. I don't know if this is true or not, but this sounds to me like something Moffat would do. He's been asked about the regenerations a lot, and more importantly he's talked about them a lot, so I think he's clearly had a story to tell about them — and the more he talks about them recently, the more I think we should expect something like this during the Christmas special. I don't have any problem with it, and I do appreciate Moffat's tendency to stick as close to the mythology of the show as the show itself will allow. What do you guys think?